One of my favorite holidays, St. Patricks Day, is almost here. It's a day when we get to celebrate all things Irish - from little green leprechauns to shamrocks. St. Patricks Day has always been a special day for us. It's the day after David and I celebrate our wedding anniversary - March 16th. We remember celebrating on our honeymoon at an Irish Pub and, as the years went by, we gave our kids Irish names. First Caitlin, then Brian, named after Ireland's King Brian Boru and finally our dear Irish Colleen. This year has found us busy making Irish Soaps. 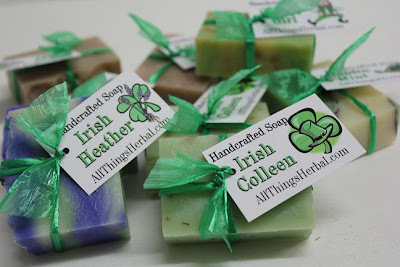 These soap favors are for a lucky Irish lass, ordered by a daughter for her mother, who is celebrating her 90th birthday on March 17th. 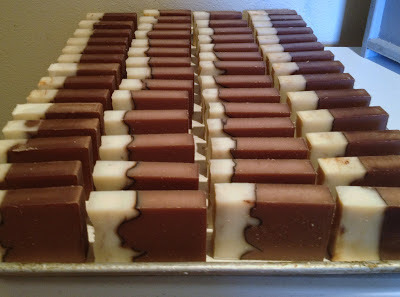 And, as St. Patrick's Day nears, we remember wrapping and mailing 150 Guinness Beer Soaps for an Irish Wedding that's taking place on St. Patrick's Day. Our largest St. Patricks Day soap project was making 500 Dublin Mint Soaps for Seasons Box in Canada. All set for labeling. Anyone want to join in and wrap soap? Oliver can't resist the ribbon. Almost ready for the shipping boxes. Ahhh, I think it's time to celebrate with an Irish Coffee. Click HERE to check out the All Things Herbal website. My passion is to make earth friendly products that keep your skin looking and feeling amazing! I began making soap in 1998 and have had a serious addiction to all things soap related since. I have an entrepreneurial spirit and a love for all things herbal and creative. This blog is my place to share inspiration, delights and herbal creations. I hope you enjoy your visit. Making Soap Loaves & a chance to win one! Soapy Holidays and a Soapy Deal! All Thing Herbal ©. Simple theme. Powered by Blogger.